What token will Bitpress use? How does that Bitpress Rank system work? What factors are taken into account in the Bitpress Ranking system? How does the Bitpress PageRank algorithm work? Isn’t this what Google’s PageRank does? How does BitPress’ PageRank algorithm differ from Google’s PageRank? Native Bitpress tokens, called XBP, are used throughout the network to pay transaction fees for publishing Articles and offering Bounties to perform work, among other things. Technical details are discussed in Token Economics, Section 5, later in this paper. Bounties contain smart contract that hold onto funds like escrow accounts. The sender pre­funds with XBP, but additional XBP can be contributed by other users using a Tip to increase the total Bounty paid when fulfilled. Bitpress uses Proof of Trust as its consensus protocol. Nodes are selected pseudorandomly to generate block, with more trusted nodes having a greater chance of being selected. Bitpress leverages the security of Proof of Work with the utility and governance of Proof of Stake. Blockchains are natively transparent and decentralized, both key components for any successful trust protocol. Reputation should only be obtained by consistent good behavior. The system needs to be robust in the face of potential attacks from malicious users. The process should be open source and available to inspect, clone, and modify. Citations from Publishers who are very trustworthy carry much more weight than those from new or poorly rated Publishers. Publishers become trustworthy by actively participating in the system. A scaling factor is used to ensure each Publisher has a minimum amount of inbound trust before they are considered credible, and a decay factor is used to ensure continued participation. In the same way that Bitcoin uses this blockchain technology as a way to exchange money, Bitpress uses this technology as a way to exchange trust. Bitpress uses these links to construct a network of cross-validations between all media organizations. PageRank assumes that all links between articles are an endorsement, but in the real world links between articles can mean many different things such as disagreement, newsworthiness, and novelty. 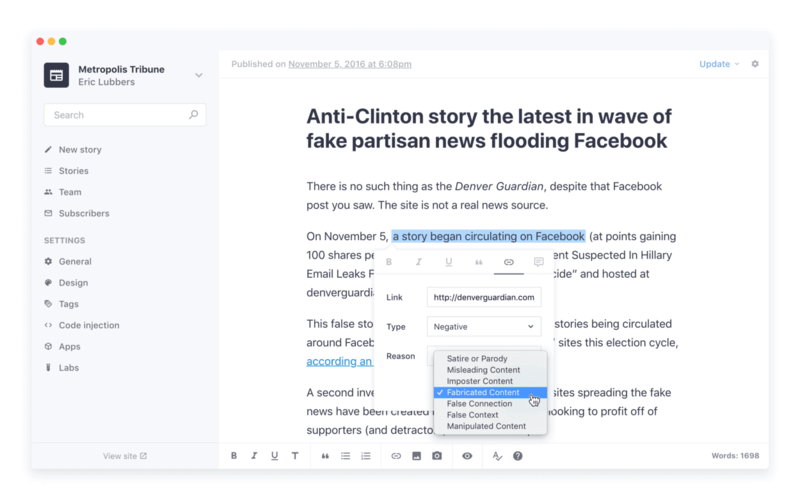 In order to account for links that do not signify endorsement, Bitpress allows journalists to indicate the context of their links. Another way that Bitpress differs from Google’s algorithm is that PageRank treats all links equally, even those from potentially untrustworthy domains. In contrast, Bitpress weighs the impact of each link according to the overall trust of the publisher. Publishers must pay a market rate in XBP based on transaction size and network congestion. These fees act to disincentivize spam and other unwanted contentPublishers have the option of hosting and running full nodes, or Power Nodes, that act similarly to Bitcoin miners, collecting and splitting the total XBP tokens of all Bulletin fees contained in a block in exchange for powering the network. To read more you can download the Bitpress White Paper. Next Next post: Why Is AWS so Important for Amazon Future Business Growth?